BCB Bank provides excellent customer service, a wide range of personal and business products, and innovative financial solutions for our customers' needs. We are also fully committed to providing our employees with an equally rewarding experience with BCB. When you join the BCB family, you become an active member of the community, which offers you invaluable opportunities to give back to the public, encourage civic responsibility, and, most importantly, make a real difference. We are continuously on the lookout for exceptional individuals to join the BCB family. We encourage all individuals seeking a professional position with us to complete a job application and submit it to the BCB Human Resources Department. In light of the high level of applications we receive, please be patient in regards to hearing a response about your application as our representatives review all potential candidates. 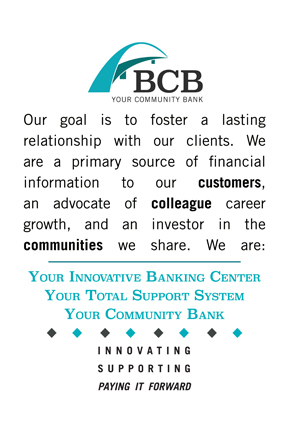 Thank you for your interest in BCB Community Bank. BCB Community Bank is an Equal Opportunity Employer of Minorities/Women/Individuals with Disabilities/Protected Veterans.